Nokia just announced on its Conversations blog that it is moving away from organizing one major annual event to organizing more than one “smaller, more intimate events” over the course of the year. Each of these smaller events will be ‘tailored to a specific audience’, Nokia says. “Think less CES, more SXSW,” the company writes. Does that mean more parties? The smaller events will still be called Nokia World, mind you, but if you’ve already made travel arrangements for a trip to the one in Helsinki at the end of September, you’re going to want to cancel them. Nokia has moved the date of the (first smaller) Nokia World event in the Finnish capital from 25-26 September (as previously communicated) to 5-6 September. Furthermore, the event is now decidedly invitation-only, and the specific audience in this case is apparently ‘operator and retail partners’. In the comments to the post on the Conversations blog, Nokia’s Heidi Lemmetyinen says “other Nokia activities for the media and bloggers will be announced in the coming weeks and months”. Arranged since 2006, Nokia World used to bring together thousands of visitors, including journalists, analysts, carriers, developers, partners and Nokia employees. 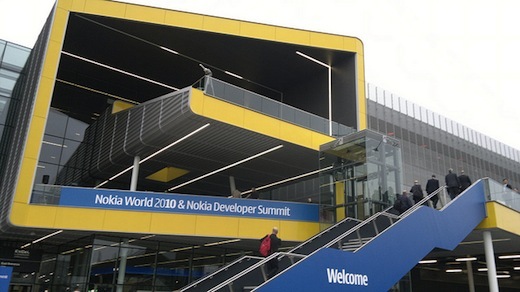 The last big Nokia World was held in London in October 2011, where the Finnish phone maker first introduced the Asha line of handsets and the Windows Phone-powered Lumia 710 and 800 smartphones with some fanfare. We’ve contacted Nokia to ask for more details about the format and timing changes.